Check out Kim's new official MySpace profile and add her to your friends! Check the tour dates page for information on a performance with Big Al Anderson and Greg Barnhill at the Steppenwolf Theatre in Chicago, IL on May 22, 2006. Kim joins Big Al Anderson and Greg Barnhill at the Swallow at the Hollow in Roswell, GA on May 5 and May 6, 2006. Cover is $30.00 and the show starts at 10 P.M. Blue-eyed soul singer Kim Carnes’ new album Chasin’ Wild Trains is now available as a limited edition with 2 bonus tracks - an acoustic version of the classic ‘Bette Davis Eyes’ plus an acoustic version of the new single ‘Just To See You Smile’. 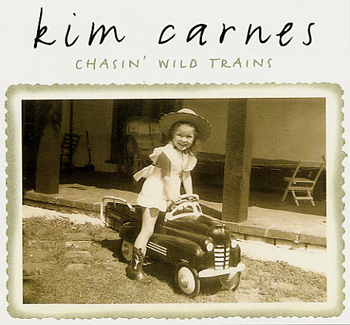 E-Zine KindaMuzik wrote: ‘The songs on Chasin’ Wild Trains are a beautiful mix of Americana, Singer-songwriter and Country rock. Highlights include the catchy Lucid Dreams (a duet with Chuck Prophet) and the ballad If I Was An Angel. Carnes’ raspy voice reminds me strongly of colleague-songwriters like Lucinda Williams and Melissa Etheridge, but nevertheless has its own sound. Chasin’ Wild Trains is simply very beautiful’. Buy the limited edition through Corazong.com . Check the Events page for information on upcoming performances. Kim will be performing with Suzy Bogguss, Gretchen Peters, and Greg Barnhill on March 30, 2006 at 12th and Porter. The show starts at 7:00 p.m. and is part of the Tin Pan South songwriter's week. A new movie soundtrack, Loggerheads - The Soundtrack, features a new song especially composed for the album, "The Silver Cord". The song was co-written by Kim Carnes and Hunter Davis. Matraca Berg, Jeff Hanna, Kim Carnes, Greg Barnhill, and special guests Jessi Alexander and Jon Randall, with Billy Panda, Tim Lauer, and Dave Ellingson, played a benefit concert for the Red Cross that raised nearly $60,000 on Saturday, October 8th, 2005. Corazong label releases "Chasin' Wild Trains"
It has been too long …Legendary ‘blue-eyed’ soul-singer and songwriter Kim Carnes, who everybody remembers by a string of top 10 singles including the marvellously haunting single ‘Bette Davis Eyes’ , released on September 16, 2005 her eagerly awaited new solo album ‘Chasin’ Wild Trains’. The first single," One Beat At The Time", a pure ballad accompanied with a simple acoustic guitar, was released on September 5th, 2005 . The B-side, "Runaway" is a smooth duet with Anders Osborne.“She's a fine musician, her sultry voice a marvelous instrument." (Jerry Wexler, legendary record producer) . Buy it at CDBABY (and hear samples) or from Corazong's recommended seller, LuckyDice. Kim's song "You Make My Skin Burn", from her long-awaited new release "Chasin' Wild Trains", will be featured in Jeff Bridges' new film, "The Moguls".